I believe one of the highest hurdles we face in an attempt to elevate the level of ‘sense on cents’ within our nation is the very fact that we live ‘in the moment and for the moment.’ How can we achieve a greater sense of perspective on the shortcomings and failings we have had in the past so we can recognize them in the future? Perhaps even more importantly, how can we simply be more aware of past failings so we can more effectively navigate the economic landscape? Should we rely strictly on our financial media, our financial regulators, and our political operatives to protect our interests? Do not be so naive. We have to do better than that. We need to take personal control and pay personal attention to our own well being. How can we do that? Welcome to Sense on Cents. UPDATE: The show has concluded, but you can listen to a recording in its entirety by clicking the Play button on the audio player below. Once the playback has started, you can forward or rewind to any portion of the show by clicking at any point along the play bar. My interview with Ronnie Sue Ambrosino was extremely interesting, touching upon elements of investor protection that concern us all. For your reference, I’d like to provide two important websites that my guest mentioned: Bernie Madoff Victims Coalition and an online petition to show a unified support for investors to receive fair and legal treatment by the Securities Investor Protection Corp (SIPC). Has our government ever failed us to the extent involved in the regulatory oversight connected to the Bernard Madoff Ponzi scheme? How could these failures have perpetuated for such an extended period? How are these failures and their impact on the victims being handled? Is insult being added to injury? Can the victims possibly receive real justice in terms of restitution and retribution? Where did the system falter? How are the victims of this travesty being treated by the powers that be on Wall Street, Washington, and in the media? I am thrilled to address all these issues on my weekly program, No Quarter Radio’s Sense on Cents with Larry Doyle, this Sunday evening August 16th from 8-9pm as I welcome Ronnie Sue Ambrosino, head of the Bernard Madoff Victims Coalition. As a sneak preview, Ms. Ambrosino was interviewed by Charlie Rose on June 29th, the day Bernard Madoff was sentenced to 150 years in prison. Ms. Ambrosino appears in the video clip at the 3 minute, 5 second mark. The issues I will address with Ms. Ambrosino run well beyond the immediate concerns of the Madoff victims. The integrity and transparency of our financial regulatory system and legal process remain very much in question. 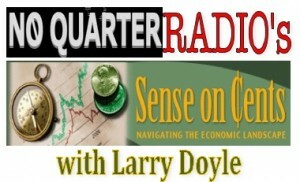 Don’t miss this important discussion Sunday evening on NQR’s Sense on Cents with Larry Doyle. I recently received an e-mail from the head of a Madoff Victims Coalition. The e-mail was in response to a post I had written about Madoff CFO Frank DiPascali. The e-mail truly moved me. With the permission of the writer, I share it with you. There is nothing more for me to add to the message embedded in this communication. America has failed these brothers and sisters of ours. Will we allow our elected representatives to permit this failure to go unheeded or merely be glossed over? Please read, ponder, and share this post with those whom you believe love this country. These people deserve our support. I feel the sincerity in your email. Thank you. It’s been a tough struggle for the last 8 months. I don’t think anyone, no matter how empathetic, can fully understand what it means to have everything you ever worked for taken away in the blink of an eye. Initially, we reeled from the loss of money, but as time goes on we realize that it wasn’t just a financial loss. Many victims feel betrayed by our country, unprotected by the alleged laws that are in place, and helpless because of those in charge of executing the laws. That’s a huge loss. Then there’s the loss of homes, medical care, legacies to children and grandchildren. The list of horrors goes on and on. There are so many aspects of our battles. We have the failure of the SEC to find the fraud. Then we have their failure to recognize it when Harry Markopolos handed them the facts. They even missed warnings from their own internal counsel. This must be addressed so that no one else will ever have to experience the devastation we are feeling.